The Wrath of the Righteous Adventure Path continues with "Sword of Valor," by RPG Superstar Neil Spicer. The PCs, now invested with righteous mythic power, are poised to become the greatest heroes of this seemingly endless war against the demons of the Worldwound... provided they can succeed at their first mission. The citadel city of Drezen was once a symbol of the First Crusade's triumph against the Worldwound, yet when a larger horde of demons attacked, they shattered Drezen's defences and captured both the citadel and the crusaders' symbol of power. Can the PCs help lead an army north to reclaim Drezen and recover this potent relic or are they marching their comrades and followers to a gruesome demise? 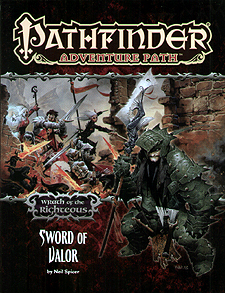 "Sword of Valor", a Pathfinder RPG adventure for 6th-level characters with a mythic tier, by Neil Spicer. An exploration of the ways cultists stitch themselves to demonkind, by Jason Nelson. A hoard of legendary relics lost to horrors of the Worldwound, by Ron Lundeen. The search for a rogue demon hunter in the Pathfinder's Journal, by Robin D Laws. Four new monsters, by James Jacobs, Jason Klimchok, Jason Nelson, and David Schwartz.